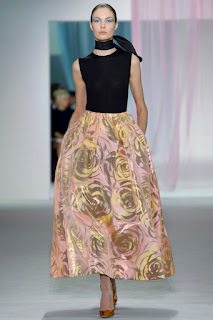 Curiosity has been settled in regards to how the big debuts went down at Paris Fashion Week SS 2013. Newly minted creative directors Raf Simons and Hedi Slimane both showed their first collections for Christian Dior and Saint Laurent (YSL) respectively. Reviews so far have been great for both with the exception of Cathy Horyn on Hedi Slimane, but that's another story. I am not a fashion critic but personally I found both collections embodied the legacy of their respective houses. Dior's lady-like silhouettes and romantic glamour were present and YSL's renowned skinny pansuit was on the runway but with a 60's/70's rock chick twist. For a person of little stature, I would find the Dior collection more wearable as it seems a girl needs to be 6 ' tall (and super skinny!) to pull of the Saint Laurent looks. But there's an edginess to the the latter collection as well that draws me in. Nevertheless, I definitely favoured the "techo-buttlerflies" beauty look created by Pat McGrath for the Dior show over the bewitching black wide brimmed hats worn on the Saint Laruent runway. Take your pick!